The film tells of a journalist's (Russell Crowe) probe into the suspicious death of a congressman's (Ben Affleck) mistress. The supporting cast includes Rachel McAdams, Helen Mirren, Jason Bateman, Robin Wright and Jeff Daniels. Macdonald said that State of Play is influenced by the films of the 1970s and explores the subject of privatization of American Homeland Security and to a minor extent journalistic independence, along with the relationship between politicians and the press. It was released in North America on April 17, 2009. The film received generally positive reviews. One night, a thief fleeing through Georgetown in Washington, D.C., is shot by a man carrying a briefcase. A deliveryman who witnesses the incident is also shot by the killer and is left in a coma. 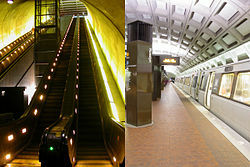 The following morning, a young woman is killed by a Washington Metro train in what seems to be suicide. Congressman Stephen Collins is distraught to hear that the woman was Sonia Baker, a researcher on his staff. Collins, who has military experience, is leading an investigation into PointCorp, a private defense contractor with controversial operations involving mercenaries. Collins tells his college roommate and old friend Cal McAffrey, an investigative reporter, that he had been having an affair with Sonia and that she had sent him a cheerful video message on the morning of her death, which he says is inconsistent and unusual behavior for someone about to commit suicide. Della Frye, a reporter and blogger with the online division of Cal's newspaper and its editor, Cameron Lynne, discover that Sonia's death occurred in one of only three CCTV blind spots in the Metro camera system. Cal believes the shootings are related to Sonia's death and finds a link between the thief and a homeless girl who sought out Cal. The girl gives him photographs that the thief, a friend of hers, had stolen from the killer's briefcase. The photos show surveillance images of Sonia talking to a well-dressed man. Della visits the hospital where the deliveryman is regaining consciousness and witnesses his murder by an unseen sniper. Later, she reviews CCTV footage and recognizes a man she saw at the hospital. Della, following a lead, finds the identity of the well-dressed man who was speaking to Sonia in the listed photographs. He is Dominic Foy, a PR executive working for a subsidiary of PointCorp. Cal blackmails Foy into talking about his activities with Sonia and secretly tapes their conversation. He reveals that Sonia was being paid to spy on Collins and to seduce him to get information for PointCorp, but she fell in love with Collins and was pregnant with his child when she was killed. Before Cal's newspaper goes to press, Collins goes on record to present his research into PointCorp. Collins's estranged wife Anne, whose conversation with Cal seems to imply a past love triangle dating back to their college years, reveals that she knows the amount of money Sonia received from PointCorp, after hearing Collins's statement to the newspaper. After the couple leaves, Cal realizes that Collins already knew that Sonia was working for PointCorp. Cal wonders what Collins would have done had he known he had been tricked and whether Collins himself is connected with Sonia's assassin. A picture of Collins from his military days, with the assassin in the frame, confirms Cal's hunch. Collins reveals that he had been suspicious of Sonia, and that he hired the assassin to watch her. The assassin is U.S. Army corporal Robert Bingham, whose life Collins had once saved. Collins says that Bingham hated PointCorp more than he did, and that he killed Sonia with no authorization. ^ "State of Play (2009) - Financial Information". The Numbers. Retrieved March 6, 2018. ^ Tim Goodman (April 16, 2006). "Two reasons you shouldn't watch 'The Sopranos' on Sunday nights: 'Prime Suspect' and 'State of Play'". San Francisco Chronicle. Hearst Corporation. Retrieved February 22, 2008. ^ Michael Fleming, Cathy Dunkley (May 5, 2004). "WB, Par have a novel idea". Variety. Reed Business Information. Retrieved November 20, 2007. ^ Adam Dawtrey (December 6, 2004). "U on Mission to put 'State' into pic play". Variety. Reed Business Information. Retrieved September 27, 2007. ^ a b c Terry Kirby (October 13, 2006). "Simm supplanted by Pitt in film version of 'State of Play'". The Independent. Independent News & Media. Retrieved September 26, 2007. ^ a b Gaël Golhen (October 15, 2007). "L'interview de Kevin Macdonald pour State of play". Première (in French). Hachette Filipacchi Médias. Archived from the original on October 31, 2007. Retrieved November 21, 2007. ^ a b c Michel Fleming, Diane Garrett (March 19, 2007). "Macdonald to direct 'State of Play'". Variety. Reed Business Information. Retrieved September 27, 2007. ^ a b Brad Brevet (September 25, 2007). "Carnahan Talks the 'State' of 'White Jazz". Ropeofsilicon.com. RopeofSilicon.com, LLC. Retrieved September 26, 2007. ^ Adam Dawtrey (October 1, 2007). "Morgan prepares 'Queen' sequel". Variety. Reed Business Information. Retrieved October 2, 2007. ^ Rachel Abramowitz, Robert W. Welkos (October 24, 2007). "While the Iron is Hot". Los Angeles Times. Tribune Company. Retrieved October 24, 2007. ^ a b c d e Lena H. Sun (April 1, 2008). "Rail to Reel". The Washington Post. The Washington Post Company. Retrieved April 2, 2008. ^ a b "State of Play Cast and Crew". Working Title Films. Archived from the original on December 5, 2008. Retrieved January 21, 2008. ^ a b c d Michael Fleming (November 21, 2007). "Brad Pitt drops out of 'State of Play'". Variety. Reed Business Information. Retrieved November 22, 2007. ^ Pamela McClintock (March 31, 2008). "2008 awards season shaping up". Variety. Reed Business Information. Retrieved April 1, 2008. ^ "UK Film release schedule: April 2009". Film Distributors' Association. Retrieved January 27, 2009. ^ Michael Bodey (January 28, 2009). "Schepisi in the wars, but hopeful". The Australian. News Limited. Retrieved January 27, 2009. ^ a b c d e Anika Manzoor (March 23, 2008). "Blazers brush with fame". Silver Chips. Montgomery Blair High School. Retrieved March 27, 2008. ^ Michel Fleming (August 10, 2007). "Rush to Judgment". Variety. Reed Business Information. Retrieved September 27, 2007. ^ Marissa Newhall (September 22, 2007). "The Post's Pitt Stop". The Washington Post. The Washington Post Company. Retrieved September 26, 2007. ^ Amanda Andrews (January 18, 2008). "The dynamic duo of British film look to TV drama as next big challenge". The Times. News International. Retrieved January 18, 2008. ^ a b c Michael Fleming (February 22, 2008). "Universal's re-born identity". Variety. Reed Business Information. Retrieved February 25, 2008. ^ Michael Fleming (December 18, 2007). "Pitt in talks to star in 'Tree of Life'". Variety. Reed Business Information. Retrieved December 21, 2007. ^ "CNN Larry King interview with Brad Pitt". CNN.com. Time Warner. December 11, 2007. Retrieved December 13, 2007. ^ Michael Fleming (December 2, 2007). "Many top names free for spring films". Variety. Reed Business Information. Retrieved December 3, 2007. ^ a b c d e f Jeffrey Ressner (April 9, 2008). "'State of Play' wraps up in D.C." The Politico. Allbritton Communications Company. Retrieved April 10, 2008. ^ Anne Thompson (August 14, 2008). "Universal's golden summer". Variety. Reed Business Information. Retrieved August 15, 2008. ^ a b Steven Clemons (March 10, 2008). "State of Play?". The Huffington Post. HuffingtonPost.com, Inc. Retrieved September 1, 2016. ^ Amy Argetsinger and Roxanne Roberts (March 18, 2008). "Running a Play for Time on the Big Screen". The Washington Post. The Washington Post Company. Retrieved August 10, 2010. ^ Steven Clemons (April 25, 2009). "Blogs in "State of Play"". The Huffington Post. HuffingtonPost.com, Inc. Retrieved September 1, 2016. ^ a b Michael Fleming (September 11, 2007). "Norton, Pitt reteam for 'State of Play'". Variety. Reed Business Information. Retrieved September 12, 2007. ^ Michael Fleming (December 18, 2007). "Norton exits 'State of Play'". Variety. Reed Business Information. Retrieved December 18, 2007. ^ Elizabeth Benjamin (June 30, 2008). "Affleck for Weiner". Daily News. Mortimer Zuckerman. Retrieved July 1, 2008. ^ TMZ staff (January 16, 2008). "Affleck Vetoes Fan Worship at Capitol". TMZ.com. Time Warner. Retrieved January 17, 2008. 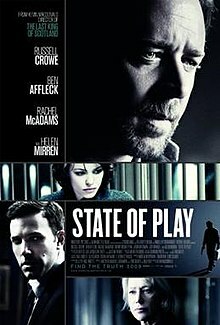 ^ "Ben Affleck: State of Play". SuicideGirls.com. April 16, 2009. Retrieved April 16, 2009. ^ "Principal Photography Begins on State of Play". Working Title Films. January 11, 2008. Archived from the original on January 17, 2008. Retrieved January 20, 2008. ^ a b Al Kamen (April 2, 2008). "Sunny Australia Sure Beats a Senate Hearing". The Washington Post. The Washington Post Company. Retrieved April 2, 2008. ^ Baz Bamigboye (February 29, 2008). "Regal Helen Mirren puts the accent on adaptability". Daily Mail. Daily Mail and General Trust. Retrieved February 29, 2008. ^ Michael Sragow (November 25, 2007). "Work in Progress - 'State of play'". The Baltimore Sun. Tribune Company. ^ a b Amy Argetsinger, Roxanne Roberts (March 6, 2008). "Honey, They Shrunk the Chief of Staff's Car!". The Washington Post. The Washington Post Company. Retrieved March 7, 2008. ^ ""State of Play" Filming on U Street March 19". Cardozo Shaw Neighborhood Association. February 9, 2008. Retrieved March 7, 2008. ^ "Movie Coming to Mt. Pleasant". Website of Washington, D.C. Ward One Council member Jim Graham. February 20, 2008. Archived from the original on March 22, 2008. Retrieved March 7, 2008. ^ Tanya Snyder (March 18, 2008). "My Boyfriend's In State of Play". Washington City Paper. Creative Loafing, Inc. Retrieved March 20, 2008. ^ Tony Rubino, Gary Markstein (April 5, 2008). "Names and Faces: The State of 'State of Play'". The Washington Post. The Washington Post Company. Retrieved March 7, 2008. ^ a b c Amy Rhodin (March 8, 2008). "Oscar winners film on campus". GW Hatchet. Hatchet Publications, Inc. Retrieved March 10, 2008. ^ a b Kevin Powers (March 22, 2008). "First Look at Russell Crowe in State of Play". Firstshowing.net. First Showing, LLC. Retrieved March 26, 2008. ^ "Two Big Movies Shooting in D.C." DCist. Gothamist, LLC. March 11, 2008. Archived from the original on March 14, 2008. Retrieved March 12, 2008. ^ a b c Allison Klein (April 3, 2008). "Putting Fact, Fiction on the Same Page". The Washington Post. The Washington Post Company. Retrieved April 3, 2008. ^ Jane Black (August 20, 2008). "50 Years of Friends and Chili". The Washington Post. The Washington Post Company. Retrieved August 20, 2008. ^ Christopher Orr (April 17, 2009). "The Movie Review: 'State of Play'". The New Republic. The New Republic. Retrieved December 18, 2009. ^ a b Phil Rothfield, Rebecca Wilson (May 5, 2008). "Russell Crowe Speaks Out". Herald Sun. The Herald and Weekly Times Ltd. Retrieved May 6, 2008. ^ "Hollywood chooses Harbour Square". Harbour Square Owners' Cooperative. Retrieved April 5, 2008. ^ "Metro's Star Turns on Film and TV". The Washington Post. The Washington Post Company. April 1, 2008. Retrieved April 1, 2008. ^ Tim Grobaty (October 31, 2007). "Another whole lotta Zep". Long Beach Press-Telegram. Los Angeles Newspaper Group. Retrieved November 1, 2007. ^ Nitin Sukamar (March 16, 2008). "Marching band to have role in upcoming thriller 'State of Play'". Silver Chips. Montgomery Blair High School. Retrieved March 27, 2008. ^ "School Notes". The Washington Post. The Washington Post Company. March 27, 2008. Retrieved March 27, 2008. ^ Jon D. Witmer (June 1, 2008). "Prieto Uses 3cP-ASC CDL on State of Play". American Cinematographer. Los Angeles, California, United States: American Society of Cinematographers. 89 (6): 88. ISSN 0002-7928. ^ "Prieto ya filma con Russell Crowe" (in Spanish). Vanguardia. January 21, 2008. Retrieved January 25, 2008. ^ Debra Kaufman (April 23, 2008). "Thoughts on NAB 2008: DI, 3D and (of course) RED". studiodaily.com. Access Intelligence, LLC. Retrieved April 24, 2008. ^ "Correction to Cinematographers in Any Budget Range". DMN Newswire. Digital Media Online, Inc. April 1, 2008. Retrieved April 24, 2008. ^ "Rhythm & Hues: Currently in Production". Rhythm and Hues. Retrieved June 30, 2008. ^ Alex Heffes, Tommy Pearson (April 2008). Interview with Alex Heffes (mp3) (Audio interview). Stage and Screen Online. Retrieved April 22, 2008. ^ "State Of Play Reviews". Metacritic. Retrieved February 12, 2010. ^ "State Of Play Review". Total Film. Future Publishing. Retrieved April 15, 2009. ^ Ebert, Roger (April 15, 2009). "State of Play Movie Review & Film Summary (2009)". RogerEbert.com. Retrieved August 12, 2013. This page was last edited on 22 March 2019, at 23:59 (UTC).